Science now proves cholesterol and saturated fats do not cause heart disease*! Arterial plaques occur under a specific set of circumstances: the presence of oxidized fats and oxidized cholesterol within inflamed arteries. The Paleo Diet eliminates sources of these dangerous oxidized versions of fats and cholesterol, reduces inflammation through the whole body, plus provides vital heart-health nutrients to support the heart and arteries. The following are five specific ways the Paleo Diet and Lifestyle enhance sound sleep. Further information is thoroughly detailed in The Paleovation Workbook (specific section locations are noted in parentheses; supplemental topic info is accessible here). The Paleo Diet is based on foods found via a hunter-gatherer lifestyle. Abundant vegetables, traditional fats and select animal products (from animals raised the way nature intended) are healthy and anti-inflammatory. Additionally, eating within a Paleo Template simultaneously removes the most inflammatory foods in a westernized diet: grains, sugar, dairy, additives, legumes and alcohol. This combination of strategies reduces and heals systemic inflammation. Modern convenience foods contain high amounts of omega-6 oils including canola, soybean, corn, vegetable, etc. In fact, many individuals favor these fats because they’re cholesterol-free. However, industrially-processed seed oils are very volatile and are damaged by air, light or heat (even in clear bottles under grocery store lighting at room temperature!). When the body ingests these rancid fats, it has no choice but to absorb and use them in the same way it would a more stable fat. Oxidized fats interfere with cell membrane integrity and healing of the arterial walls. They are a key trigger for arterial plaque development! Avoiding industrial oils and trans fats takes consistent effort, so knowledge of where these fats lurk is crucial to limiting exposure. Just as with fats, there are good and bad sources of cholesterol. Cholesterol-rich foods from animals raised on a pasture are beneficial on multiple levels. Cholesterol naturally occurs with other nutrients which nourish cells and support fat-soluble vitamin absorption and cholesterol utilization in the body. Sadly, when the food industry manipulates cholesterol-rich foods into powders, it oxidizes the cholesterol during the spray-drying process. These powders (powdered milk, cheese, eggs, etc) are often used in baking mixes and convenience foods for flavoring. As with oxidized fats, avoiding oxidized cholesterol is critical for protecting the heart. Knowledge is power. Though the body is completely capable of manufacturing its own cholesterol (which is vital for brain health and memory! ), eating cholesterol-rich foods provides specific nutrients to support the heart. Pasture-raised animal products contain fat-soluble vitamins including Vitamin K2 to gather calcium deposits from the arteries and redirect it into the bone. Another crucial nutrient is Coenzyme Q10 (CoQ10), required to provide energy for the heart and liver. The Paleo recommendation for nose-to-tail eating incorporates organ meats, bone marrow, bone broth and other less common cuts that perfectly provide a wide range of heart-health nutrients. Though high cholesterol levels don’t correlate with heart disease risk, high triglyceride levels do. Surprisingly, triglycerides are not caused by saturated fat intake. They are the result of trans fat and excessive glucose (carbohydrate) in the diet. The Paleo Diet addresses this on two levels: unstable fats are avoided and carbohydrate intake is moderated. Paleo doesn’t have to be low-carb, but it is significantly lower in carbohydrate than a typical western diet. This moderate carb level is more easily metabolized for energy and less likely to be used for fat storage or triglyceride production. Triglyceride levels are one of the first markers of health to stabilize after adopting a Paleo Diet. *Note: The fact that saturated fats and cholesterol do not cause heart disease is fully supported by scientific studies, however these ideas are just emerging into the mainstream. Do not be surprised by a lag time before dietary recommendations shift to accommodate this new knowledge (though the 2015 USDA dietary guidelines already removed restrictions on dietary cholesterol). In the meantime, do your own research; experiment with your own diet. 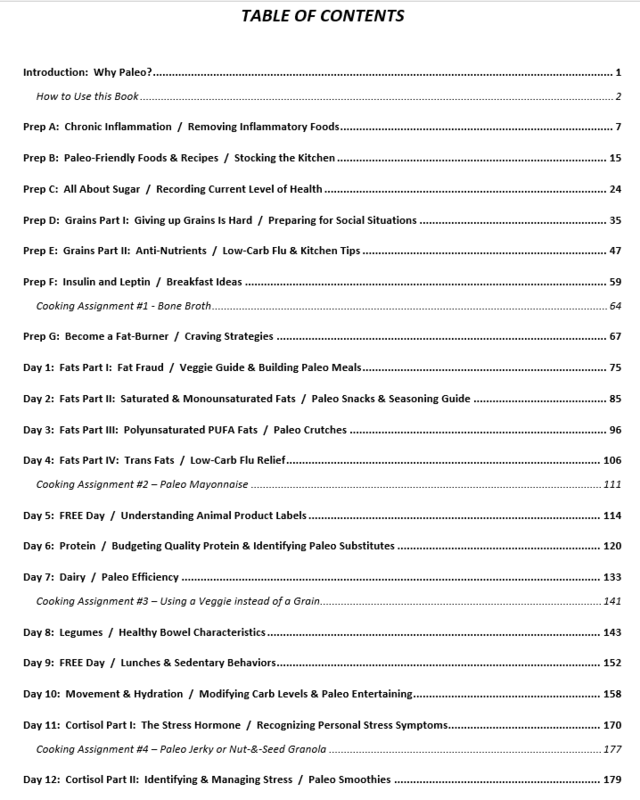 FYI, two full days of The Paleovation Workbook’s program are dedicated to the topics of cholesterol and heart disease, and four days discuss the role fats play in whole body health. Suggestions for further reading and research on these topics can be accessed through the Paleovation website References page. An elimination period of 2-3 weeks often reveals dramatic health benefits including better blood pressure, more supple arteries, lower triglycerides, improved energy levels and less inflammation throughout the whole body (with noticeable differences in achy muscles/joints and better range of motion). The best news is health benefits emerge solely from conscientious food choice: just eliminate inflammatory foods and emphasize restorative, traditional foods. There are no expensive powders, specially-formulated products or endless exercise routines necessary.